The Color LIne paints can be tricky to fire the first time around. On this piece my reds disappeared. I spoke to Dusten at Bulleye Glass and he said to vent the kiln up to 1100 or 1200 degrees and then open the kiln completly for 15 seconds. That lets out the fumes and replaces air with fresh oxygen which the Reds need to fire properly. I tried that on the second piece that I painted another layer over in certain areas. As you can see the colors did not disappear again in those areas because of the 15 second venting process. Problem solved. Bullseye and their employees are very willing to help you out with your fusing problems. Try emailing or calling them with your problems. They also have a Facebook page for the Color Line Paints. Reds and Yellows disappeared after firing.....this was vented up to 1200 degrees. repainted and fired with venting up to 1100 then the kiln was opened completely for 15 seconds then closed again until schedule completed. I got a set of Color Line glass enamel paints for Christmas. This is my first painting I did with them. I did the painting on an ivory piece of glass and edged it with a dark grey Opal glass. The paints were pretty easy to work with and they can be thinned with water or the medium they make to go with these paints. You can use them thick or watery like water color. They fire pretty close to the way they look unfired. The only catch is the reds burn off or disappear if you don't vent the kiln properly when firing. You can get help with that problem from Bullseye Glass company and also from the product brochure. Otherwise I am quite excited about using them. 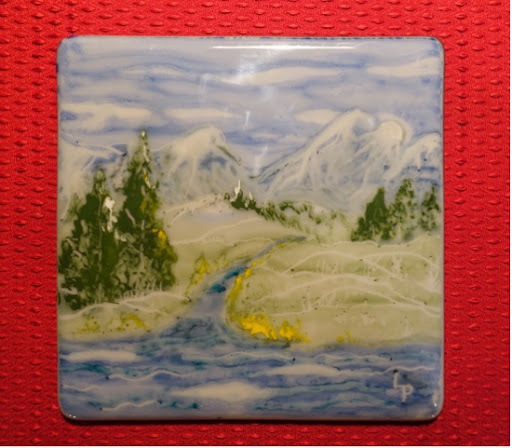 The piece above is 8x8 and can be slumped into a square plate mold or left as an art panel to display in a stand or hang with a plate hanger on the wall.